A while ago, in a post featuring monkey and baboon attack covers, I included the cover of the May 1955 issue of Men magazine. The cover painting on that issue was done by the great Mort Kunstler, who is now best known for his epic Civil War paintings. 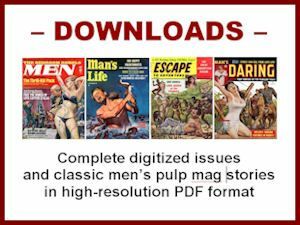 Kunstler is one of the most talented and renowned artists who once provided cover art and interior illustrations for men’s pulp magazines in the Fifties and Sixties. The painting he did for the May ‘55 issue of Men shows a manly white hero desperately trying to fight off a horde of vicious-looking Mandrill baboons, using his apparently empty rifle as a club. The odds don’t look good for our hero. And, his African sidekick is already down. If you look at the lower right hand corner of the Men magazine cover, you’ll see the bloodied native guy on the ground, overcome by enraged Mandrills. I recently found out from Rich Oberg, the men’s adventure art collector and expert, that Kunstler modified this baboon attack painting years later for use on the cover of the April 1971 issue of Male magazine. Rich sent me a photo of the modified painting, which he owns. It’s shown at right. At first glance, I didn’t catch the difference. Then my eyes focused on the bottom right hand corner and I saw it. 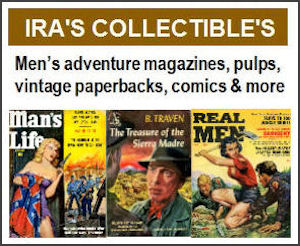 As Rich confirmed to me, Kunstler had painted over the African native seen on the cover of Men — and transformed him into a blonde damsel in distress for the Male cover! I’ve noticed cover paintings used on more than one men’s adventure magazine. But I think this is the only example of transgender surgery by a men’s pulp mag artist. Rich and I both have a fondness for the gonzo animal attack covers used on many vintage men’s pulp magazines. 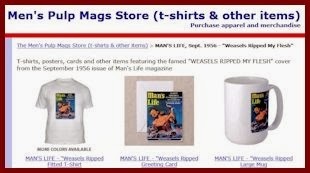 In fact, the legendary “Weasels Ripped My Flesh” cover by Will Hulsey, on the September 1956 issue of Man’s Life, inspired me to start this blog. Most of the scenes shown in these man (and/or woman) vs. beast cover paintings are fantastic — in both senses of the word. They show things that would never happen in the real world, making them pure feats of imagination. And, they are often fantastically well-executed pieces of vintage illustration art. Among my favorites is Mort Kunstler’s painting of “vicious” pangolin anteaters, used on the cover of the Winter 1956-57 issue of Sport Trails magazine. If you watch the SyFy Channel, you know that one of the favorite killer animals used in the Grade-B (sometimes Grade-Z) horror movies it shows is the Komodo dragon. But decades before there were Komodo flicks on Syfy, killer Komodo dragons were featured on and in men’s pulp mags. Below is another great Mort Kunstler cover painting, showing another manly hero fighting a huge Komodo dragon with a sword. It was used on the June, 1955 issue of Male magazine. Of course, Komodo dragons can actually be dangerous, unlike weasels and anteaters. However, I doubt if they rear up on their hind legs like the one in Kunstler’s painting. And, I doubt if anything like the scene depicted in it has ever happened. It’s a creation of the imagination, beautifully executed by a great pulp artist. Mort Kunstler’s Komodo, pangolin and Mandrill attack paintings are just a few of the mind-blowing original cover paintings owned by Rich Oberg. 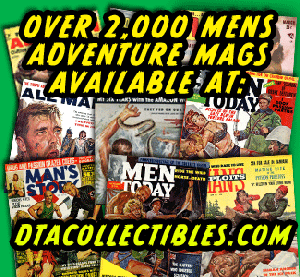 There are other examples in the excellent book that features art and magazine covers from his collection, Taschen’s Men’s Adventure Magazines in Postwar America. But even that only shows a small part of Rich’s pulp treasures. 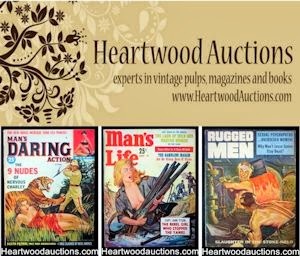 Rich recently created a website — MensAdventure.com — where he has started posting photos of the cover paintings he has collected and the covers they were used for. Luckily for me, he is also becoming a regular contributor to this blog, and is graciously allowing me to show original cover paintings from his collection, including some that have never before appeared in books or on the Internet. It’s one of a series of lushly illustrated books featuring his historic paintings.